If you received an email in which someone promises you a fabulous fortune just for doing something which is almost no trouble, they usually need some information from you. Nigerian scams, Lottery scams and many other types of fraudulous emails request you to send personal identifiable information and sometimes even a bank account in order to transfer you large amounts of money. Use your common sense and think always that if something is too good to be true, then it is usually a fake or a fraud. Nobody will ever give you money just for being an intermediate. There are always strings attached and even if the action is not a scam, it is definitely illegal. Sometimes these emails are pretending to be from your bank and you are asked to validate something in order to be allowed retrieve an amount of money, to participate to a survey or whatever. Always remember that a bank will never ask you to validate your identity via email. They know already who you are! Phishing attempts on the other side, don’t know who you are and require you to enter financial information in orderto be able to get some money from your bank account. 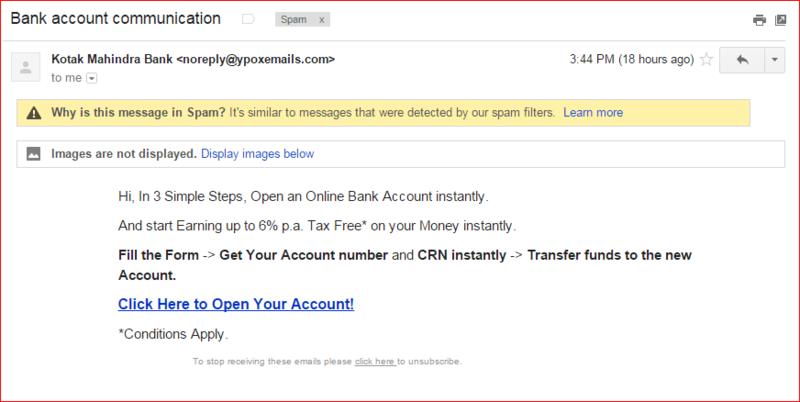 Never respond to such emails that pretend to come from your bank!